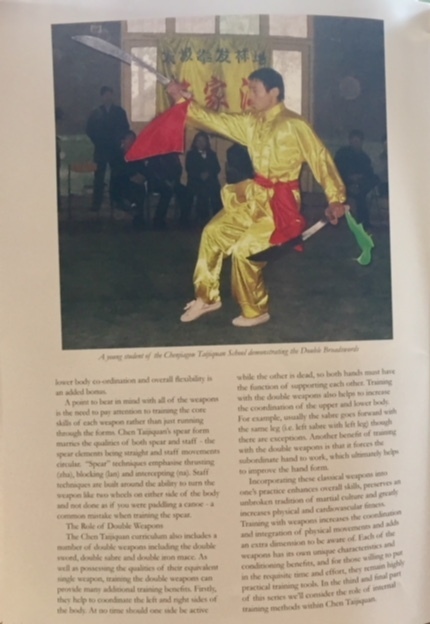 Just out part two of a three part article published by Tai Chi Chuan & Oriental Arts magazine looking at Chen Taijiquan’s integrated syllabus - this time looking at the place of weapons training. A quick note for anyone seeing the magazine – an article with the imaginative title “From Organ Builder to Arms Dealer” is mistakenly attributed to me. Just to be crystal clear, it’s not mine! Chen Taijiquan has an extensive and complex corpus for developing skilled and effective martial practitioners. 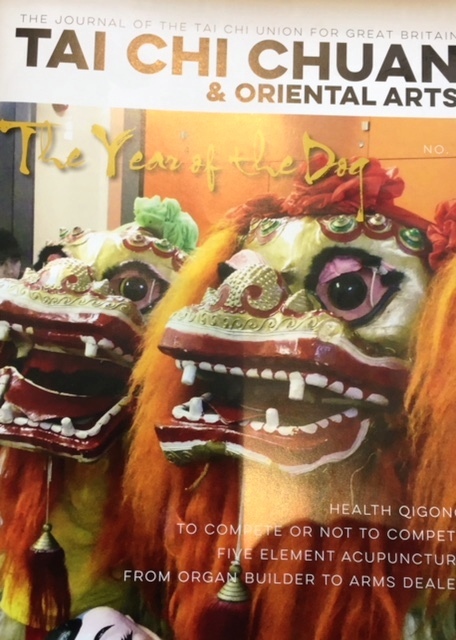 In this issue we continue to examine the way in which the seemingly different aspects of the Chen Taijiquan syllabus are actually interrelated and mutually supporting. In the first part we looked at the relationship between form training and push hands. Here we examine the role of weapons training within the wider Taijiquan curriculum and the way in which the various weapons can be used to develop the physique and qualities of a Taijiquan player. Preserved within the weapons routines are flexible sinuous movements, dynamic actions, swift changes in tempo, and fierce chopping, slicing or thrusting movements. Here we’ll consider how the demands of the different weapons, with their distinct characteristics and techniques, can have a transformative effect shaping new levels of body awareness and dexterity. A wide variety of weapons continue to be practiced in Chenjiagou, the birthplace of Taijiquan, a fact that comes as something of a surprise to many people. These include the sword, broadsword, spear, halberd, long pole, eyebrow staff and double iron mace, among others. 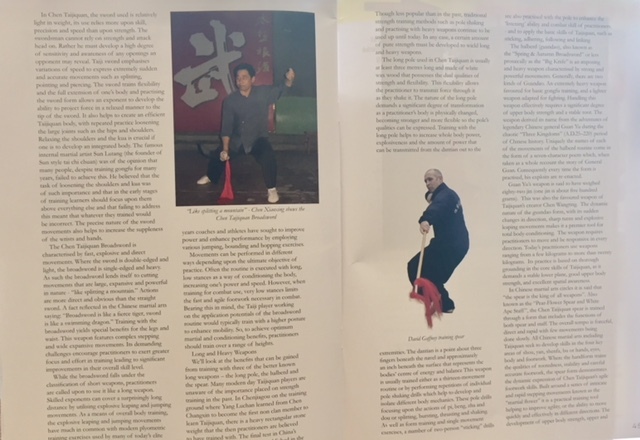 Some of these weapons are drawn from China's ancient battlefield arts; others like the two section pole, evolving from agricultural tools, to eventually be incorporated within the Chen Family Taijiquan weapons syllabus. Knowing that the likelihood of ever having to use the weapons for their original purpose is unlikely, leads many practitioners to the conclusion that they are irrelevant in the modern age. Even those that do incorporate weapons into their practice often fail to see beyond the surface elements of performance and aesthetics, losing sight of the many potential benefits that can be gained from them. During one of our early trips to the Chenjiagou Taijiquan School in China’s Henan province we were instructed that Taijiquan combat skill could only be achieved by gaining proficiency in four key areas: constitution or basic physical conditioning; strength; technical skill and gongfu or cultivated skill. Taijiquan, in common with all traditional Chinese martial arts involves the balancing of internal and external aspects. Without an external basis any internal development is of limited value. To put it bluntly, ""coordinated strength" means nothing if you don't have any strength to coordinate". Beyond their obvious functions, the different weapons help to train many diverse qualities essential in honing a “Taijiquan physique" - attributes such as strength, dexterity, agile footwork and whole-body coordination. Weapons practice can help to achieve correct timing in all one's movements. Holding and manipulating the various weapons also lead to improvements in the complexity of your hands and footwork skills. Viewed in the context of the system as a whole, weapons training complements barehand training by magnifying certain requirements: the mind and intention must be extended all the way through the length of the weapon; movements must stay relaxed, agile and efficient at the same time as controlling a weighty object; and footwork must be lively and responsive to enable rapid changes position. In Chen Taijiquan, the sword used is relatively light in weight, its use relies more upon skill, precision and speed than upon strength. Its lightness means that the swordsman cannot rely on strength and attack head on. Rather he must develop a high degree of sensitivity and awareness of any openings an opponent may leave. Taiji sword emphasises variations of speed to express extremely sudden and accurate movements such as splitting, pointing and piercing. The sword trains flexibility and the full extension of one’s body and practising the sword form allows an exponent to develop the ability to project force in a relaxed manner to the tip of the sword. It also helps to create an efficient Taijiquan body, with repeated practice loosening the large joints such as the hips and shoulders. Relaxing the shoulders and the kua is crucial if one is to develop an integrated body. The famous internal martial artist Sun Lutang was of the opinion that many people, despite training gongfu for many years, failed to achieve this. He believed that the task of loosening the shoulders and kua was of such importance and that in the early stages of training learners should focus upon them above everything else and that failing to address this meant that whatever they trained would be incorrect. The precise nature of the sword movements also helps to increase the suppleness of the wrists and hands. The Chen Taijiquan Broadsword is characterised by fast, explosive and direct movements. Where the sword is double-edged and light, the broadsword is single-edged and heavy. As such the broadsword lends itself to cutting movements that are large, expansive and powerful in nature - “like splitting a mountain.” Actions are more direct and obvious than the straight sword. A fact reflected in the Chinese martial arts saying: “Broadsword is like a fierce tiger, sword is like a swimming dragon.” Training with the broadsword yields special benefits for the legs and waist. This weapon features complex stepping and wide expansive movements. Its demanding challenges encourage practitioners to exert greater focus and effort in training leading to significant improvements in their overall skill level. While the broadsword falls under the classification of short weapons, practitioners are called upon to use it like a long weapon. Skilled exponents can cover a surprisingly long distance by utilising explosive leaping and jumping movements. As a means of overall body training, the explosive leaping and jumping movements have much in common with modern plyometric training exercises used by many of today’s elite sports performers. Simply put the combination of speed and strength is power and for many years coaches and athletes have sought to improve power and enhance performance by employing various jumping, bounding and hopping exercises. Movements can be performed in different ways depending upon the ultimate objective of practice. Often the routine is executed with long, low stances as a way of conditioning the body, increasing one’s power and speed. However, when training for combat use, very low stances limits the fast and agile footwork necessary in combat. Bearing this in mind, the Taiji player working on the application potentials of the broadsword routine would typically train with a higher posture to enhance mobility. So, to achieve optimum martial and conditioning benefits, practitioners should train over a range of heights. We’ll look at the benefits that can be gained from training with three of the better known long weapons – the long pole, the halberd and the spear. Many modern day Taijiquan players are unaware of the importance placed on strength training in the past. In Chenjiagou on the training ground where Yang Luchan learned from Chen Changxin to become the first non clan member to learn Taijiquan, there is a heavy rectangular stone weight that the then practitioners are believed to have trained with. The final test in China’s imperial military examinations established in the Ming dynasty was lifting just this kind of weight. Though less popular than in the past, traditional strength training methods such as pole shaking and practising with heavy weapons continue to be used up until today. In any case, a certain amount of pure strength must be developed to wield long and heavy weapons. The halberd (guandao), also known as the “Spring & Autumn Broadsword” or less prosaically as the “Big Knife” is an imposing and heavy weapon characterised by strong and powerful movements. Generally, there are two kinds of Guandao. An extremely heavy weapon favoured for basic gongfu training, and a lighter weapon adapted for fighting. Handling this weapon effectively requires a significant degree of upper body strength and a stable root. The weapon derived its name from the adventures of legendary Chinese general Guan Yu during the chaotic “Three Kingdoms” (A.D.25–220) period of Chinese history. Uniquely the names of each of the movements of the halberd routine come in the form of a seven-character poem which, when taken as a whole recount the story of General Guan. Consequently every time the form is practised, his exploits are re-enacted. Guan Yu’s weapon is said to have weighed eighty-two jin (one jin is about five hundred grams). This was also the favoured weapon of Taijiquan’s creator Chen Wangting. The dynamic nature of the guandao form, with its sudden changes in direction, sharp turns and explosive leaping movements makes it a premier tool for total body-conditioning. The weapon requires practitioners to move and be responsive in every direction. Today’s practitioners use weapons ranging from a few kilograms to more than twenty kilograms. Its practice is based on thorough grounding in the core skills of Taijiquan, as it demands a stable lower plane, good upper body strength, and excellent spatial awareness. In Chinese martial arts circles it is said that "the spear is the king of all weapons". Also known as the “Pear-Flower Spear and White Ape Staff”, the Chen Taijiquan spear is trained through a form that includes the functions of both spear and staff. The overall tempo is forceful, direct and rapid with few movements being done slowly. All Chinese martial arts including Taijiquan seek to develop skills in the four key areas of shou,yan, shenfa, bu or hands, eyes, body and footwork. Where the handform trains the qualities of rootedness, stability and careful accurate footwork, the spear form demonstrates the dynamic expression of Chen Taijiquan’s agile footwork skills. Built around a series of intricate and rapid stepping movements known as the “martial flower” it is a practical training tool helping to improve agility, or the ability to move quickly and effectively in different directions. The development of upper body strength, upper and lower body co-ordination and overall flexibility is an added bonus. A point to bear in mind with all of the weapons is the need to pay attention to training the core skills of each weapon rather than just running through the forms. Chen Taijiquan's spear form marries the qualities of both spear and staff - the spear elements being straight and staff movements circular. "Spear" techniques emphasise thrusting (zha), blocking (lan) and intercepting (na). Staff techniques are built around the ability to turn the weapon like two wheels on either side of the body and not done as if you were paddling a canoe - a common mistake when training the spear. The Chen Taijiquan curriculum also includes a number of double weapons including the double sword, double sabre and double iron mace. As well as possessing the qualities of their equivalent single weapon, training the double weapons can provide many additional training benefits. Firstly, they help to coordinate the left and right sides of the body. At no time should one side be active while the other is dead, so both hands must have the function of supporting each other. Training with the double weapons also helps to increase the coordination of the upper and lower body. For example, usually the sabre goes forward with the same leg (i.e. left sabre with left leg) though there are exceptions. Another benefit of training with the double weapons is that it forces the subordinate hand to work, which ultimately helps to improve the hand form. Incorporating these classical weapons into one’s practice enhances overall skills, preserves an unbroken tradition of martial culture and greatly increases physical and cardiovascular fitness. Training with weapons increases the coordination and integration of physical movements and adds an extra dimension to be aware of. Each of the weapons has its own unique characteristics and conditioning benefits, and for those willing to put in the requisite time and effort, they remain highly practical training tools. In the third and final part of this series we’ll consider the role of internal training methods within Chen Taijiquan.